Playing a bit of catch-up. Daylight Savings Time always does a number on me. A young person definitely came up with this list. If there’s one thing I’ve learned as I’ve matured, it’s that we’re never truly independent. We depend on other people for almost everything, and upon God for everything ELSE. Still, I recently heard a song that I associate with a very isolated time in my life. I’d just graduated from college and had opted to stay in my college city to attempt to find my own way. This was the first time in my life that I felt truly alone, with no relatives within 500 miles. And as I watched my family pull away that late-spring day, I felt a wave of misery that threatened to buckle my knees. I recovered within the hour, though. Probably the fact that one of my hallmates hadn’t quite left town for summer yet (the dorm we lived in was essentially an apartment, so we had some weeks left to find new housing) helped to mitigate the loneliness. The song’s about drugs, or withdrawal from same, so I really don’t relate. And it’s not even my favorite song of the album. But it’s the one for the day. At first, I was going to punt on this one, since there’s no news story that reminds me of a song, or vice versa. But yesterday’s song reminded me that the band’s lead singer had died from drug addiction. 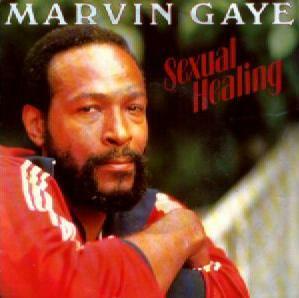 That made me recall another singer whose struggle with addiction indirectly led to his early death, in 1984 — Marvin Gaye. Although I really wasn’t familiar with him or his music at the time, I have never forgotten the moment I heard the news. He’d been shot dead by his father in a domestic scuffle including over money, his drug use and increasingly violently paranoid behavior. …always reminds me of the day he died. Bitterly ironic.